November is still autumn on the calendar, but in Scandinavia, it is the beginning of the winter season, which comes early and lasts long. In the five countries in northern Europe that are generally recognized to make up Scandinavia—Norway, Denmark, Sweden, Finland, and Iceland—it’s quite dark with shortened hours of daylight during the month. The days can be characterized as dreary and bleak, and the countryside is often blanketed in thick snow. Tourism traffic is low this month, which can mean big savings on airfare and hotel prices for off-season visitors. Winter has definitely arrived in Scandinavia by November. The weather in Scandinavia varies by destination. For example, Copenhagen, Denmark, has a mild, temperate climate due to its location near the North and Baltic Seas. The average high temperature in Copenhagen for November is around 40 F, and rainfall measures an average of 2.5 inches. By comparison, Helsinki, Finland, experiences longer and colder winters with average high temperatures in the 30s and rainfall of about 3 inches. In many parts of the region, you will experience winds and rainfall, which turns into snow as you go north. Passing cold fronts produce precipitation, which can be followed by cold, clear weather with a few clouds. One advantage of traveling to Scandinavia when it is very cold may be the ability to see the Northern Lights in the clear nighttime skies. At that time of year, you will want to wear layers because November can get very cold during the day and freeze at night. Use thicker long-sleeve shirts layered with a breathable, but warm fleece or wool sweater on top so you can easily remove the warm outer layer when you are indoors. Pack well-insulated clothing if you plan to go skiing or sledding. 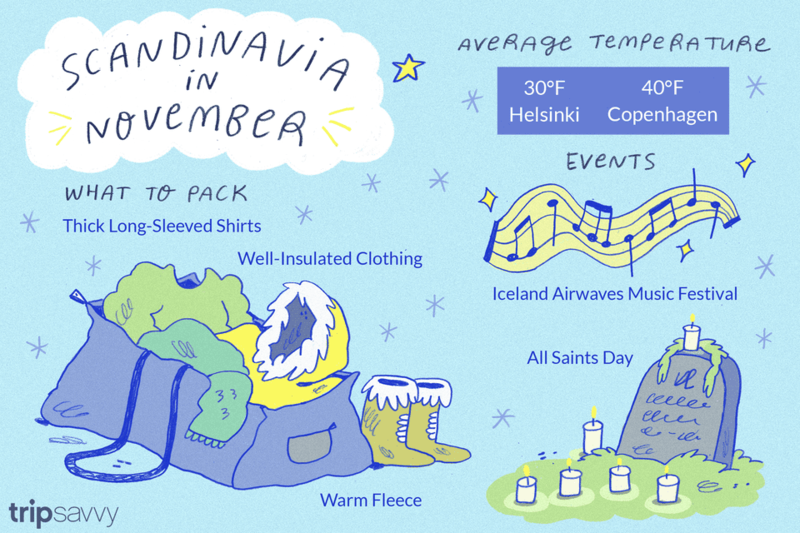 Things definitely slow down in Scandinavia during the winter months, but some annual events featuring music, films, and food draw crowds regardless of the cold. Iceland Airwaves: This music festival held in venues around downtown Reykjavik showcases new bands from Iceland and other countries over four days usually the first week of November. Packages are available from the U.S. and other countries that include airfare, hotels, and admission to the festival. Stockholm International Film Festival: Held over 12 days in mid-November, this film festival offers about 200 films of varied genres from 60 countries. The well-attended event typically includes seminars and meetings with actors and filmmakers. The film voted by a jury as the best in the competition section receives the Bronze Horse (Bronshästen). Rakfiskfestival: The traditional Norwegian dish, rakfish, is made from salted and fermented trout; Norwegians consume tons of rakfish every year. The town of Fagerness, three hours north of Oslo, hosts this annual three-day festival that draws thousands to enjoy the salty fish, washed down with beer and aquavit. There are two religious holidays that are celebrated in November: All Saint's Day and St. Martin's Day. The two are not strictly observed but if you are visiting Scandinavia at the time you may notice families gather for large meals and you may have some difficulty getting restaurant reservations around the two holidays. All Saints' Day, traditionally on November 1, is a day of reflection that marks the first day of the Scandinavian winter and commemorates the dearly departed. All Saints' Day in Sweden and Finland is celebrated on Saturday between October 31 and November 6. In Denmark, it is celebrated on the first Sunday. On St. Martin's Eve, November 10, Swedish and Danish families celebrate the goose with a large feast in restaurants and homes. Europe's electrical system is different from the U.S. in two ways: the voltage of the current and the shape of the plug. American appliances run on 110 volts, while European appliances are 220 volts. If you see a range of voltages printed on the item or its plug (such as "110–220"), you are OK in Europe. Most mobile devices like cellphones and laptops can accept 220 volts. All, you will need is a cheap prong adapter for that appliance that can run on 220. If the electronic device is not able to run on 220 volts, then don't bring it or expect to pay for a bulky, costly power converter.